In the Old Testament there are many examples of God’s amazing providence, love, miraculous power, and protection. Often when a particular event or battle or breakthrough occurred due to the Lord’s action, the people who recognized the source of the power erected a marker stone so they would never forget what God did. I will never forget all of the ways God brought me through each day of the last two years, but I wanted to make sure I had a visible reminder so I would never miss the opportunity to give Him credit. 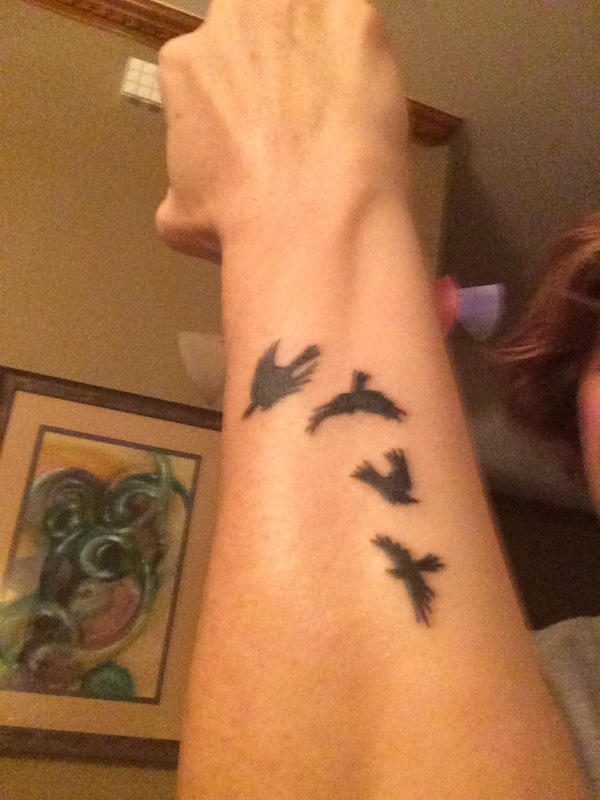 The four birds represent the day I understood that God would take care of us in every way. After He walked beside me as we lost Jeff, I was met with obligations and decisions that I was not prepared to undertake. In the most minute detail HE provided. I can’t begin to list the hundreds of things I had to figure out, but it is an understatement to say I was not prepared and feared that I could not take care of our family. God was and always will be faithful and continues to show me that His provision is just an outward representation of His love for us. After a year has passed, I am proud to show every person I see just how big God is and how much He loves us: my tattoos make sure I can never forget and will never be intimidated or embarrassed to share my story. Each one beautifully represents a revelation, promise, or hope that God gave to me. People ask me about them everywhere I go. They are my marker stones and they keep me honest. I’ve been thinking about Sept.19, and how much I miss Jeff terribly….Ran and I still talk about him and the impact he has made on us personally. Cant imagine how tough this year has been for you and the kids. Whenever I see you all, I’m amazed at the strength, courage and peace. Thank you for being so real and raw with your posts. Those Ravens are banners of His love and plan for your life. Wear them with pride! Elizabeth, they are just beautiful. I got my tattoo after I lost my Seth. He had gotten his first tattoo a few months before he passed. I can still remember it like yesterday! He was anxious to get it and he had thought about it in earnest. He came up with it on his own. It was a small cross intertwined with a treble clef. He said he chose it to be on the inside of his right wrist so that when he held his microphone, he would always remember the gift God had given him of his voice. I now wear it proudly on my left inside calf. I too, know that God was with me as I also felt HIS presence in those early days after Seth left us. Have seen people looking at mine and if they ask, I share my story. There are now at least seven different peopl who sport that tattoo, and others in honor of Seth. Your story and your strength amaze me. You are one strong woman. Thank you for sharing this!!! !